Vegetation/wildlife: the surrounding rosebay willowherb had grown to almost the height of the piano (about 1.5m). There were no ants. A small spider ran down one of the bass strings as I played. As usual the birds sang loudly. State of piano: Most of the keys did not produce a sound when pressed. Many of the notes that did sound stayed down when pressed and were then unusable. There were about ten or eleven keys that reliably and repeatedly sounded. The timbre, tuning and attack of these varied greatly. The dampers had expanded and stopped many of the strings vibrating even when the damper pedal was down. Once I started playing I realised several things. Firstly, I didn’t know which keys worked or what they were going to sound like. Secondly there was an audience of about ten people. It suddenly occurred to me that I had to make music out of the process of discovering what state the piano was in. I had understood this in theory beforehand but it was only when I started playing that I realised how unlike a normal piano this instrument had become. This improvising really was the sound of discovery. For the audience the performance probably walked a tightrope between being boring and sharing in the process of discovery. A particularly boring few minutes happened when I tried to tape the ebows onto the strings. A beautiful sine-tone-like sound emerged and then faded, scraping, nothing, another tone, scraping, fade. The tape didn’t hold. In the end I had to make do with one ebow in each hand (I tried holding two ebows in each hand but this produced some boring moments too). Once the hand fan was involved the sound took off. To my surprise it created a lovely tampura-like drone (you can hear this on Piano in the Woods 2: milk frothing whisk at 3:10). I found the experience moving and almost overwhelming. This was due in part to the fact that my wife was having our second child the next morning. There was also a peculiar energy around the event. After the performance I started writing some notes on the weather/temperature etc. and I found that I could barely hold the pen. This was partly due to sitting cross-legged under the piano for twenty minutes and partly to this overwhelming feeling. Neil Sloman has agreed to take a photograph of the piano from the same spot with the same camera at each performance. This bright idea came from Elise from Sondryfolk. The plan is to finish the project with twelve photographs documenting the changing conditions of the piano and surrounding vegetation. No one knew who this is or who planted the tree. The tree is not spectacular. It is about 2m tall with a few reddish leaves. There is a bench to the far side of the tree that is similar to the bench that we found on the spot where we put the piano. 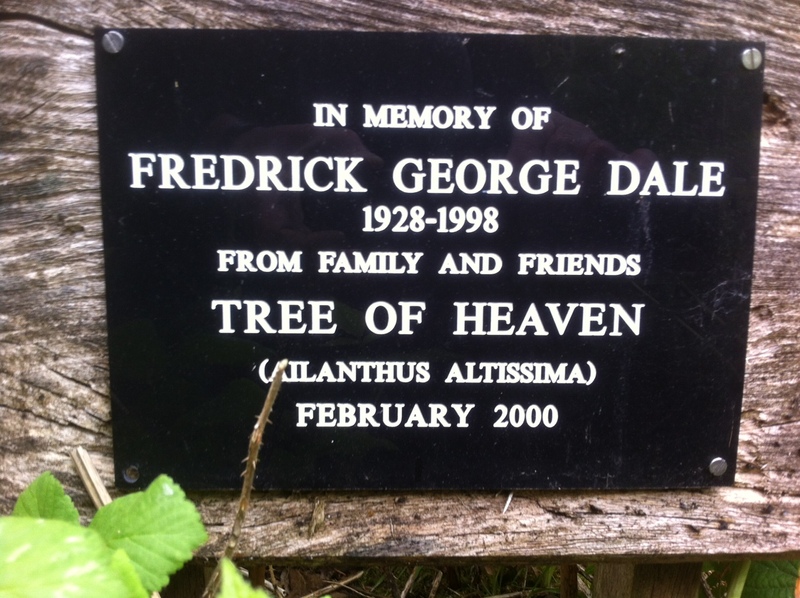 It is interesting that out of the whole woodland Mr Dale chose the same spot to be buried that we chose for the piano. 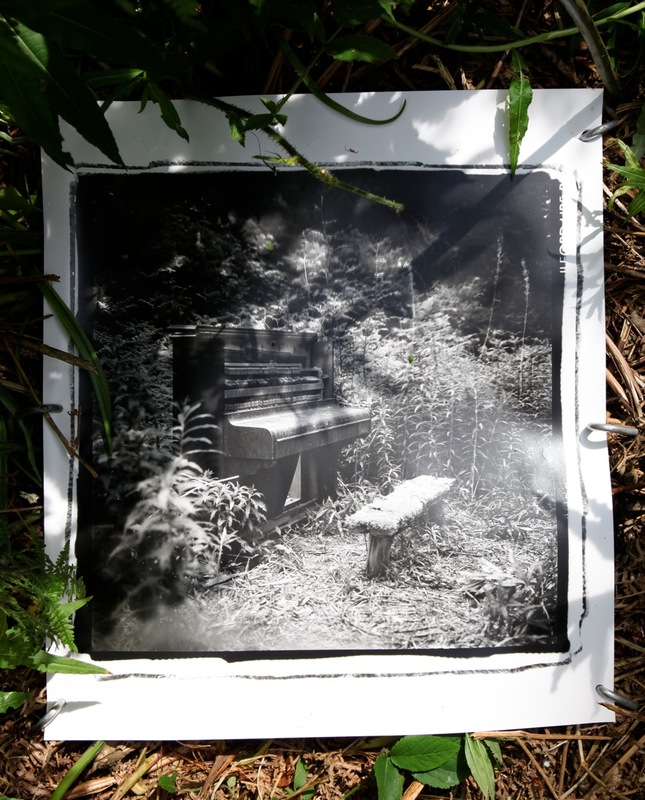 Neil has made a large print of the piano that he has left beside the instrument in the forest. I look forward to seeing how this image decays alongside the piano. Neil Sloman, a set on Flickr. There is something about this concept that I absolutely love and resonate with. The flaws (created by nature upon a piano left outside) create a spontaneity that can’t be replicated. Neither the artist nor the audience know what the flaws will be. The flaws are not only accepted but are integral to the performance. They create delight and curiosity rather than judgment. A shared unknowingness to what will happen. I also love that it is a small gathering in a wood, so opposite to the glitz of mainstream. It’s a hidden delight to be discovered. There is a charm to this concept and a magic to it.